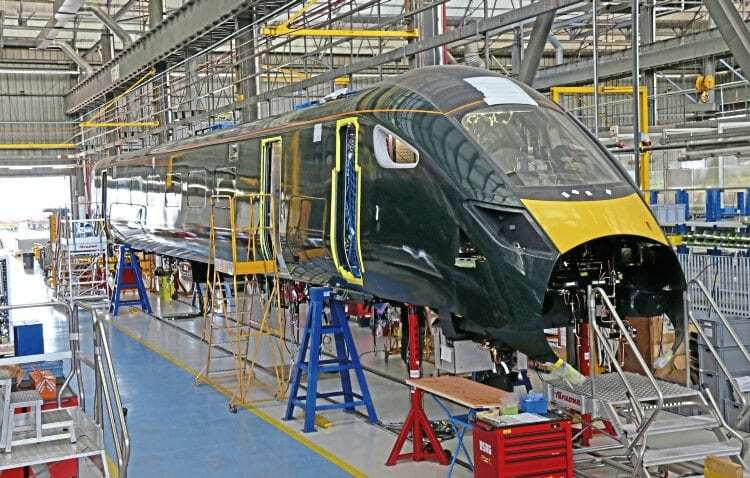 Hitachi took members of the media and stakeholders as well as customers, GWR and Eversholt, to see progress made on manufacturing the new Class 802 West of England trains in late May. The bi-mode trains are being built in Italy by Hitachi Rail Italy, which is the new name for Ansaldo Breda, the company Hitachi bought in 2015. In total 22 five-car and 14 nine-car Class 802s are on order for GWR. Hitachi is building the 33 series Class 802 trains at the Pistoia factory in Italy using prefabricated car body parts made in Hitachi’s Japanese factory in Kasado. The bogies are being made by the Hitachi Italy plant in Naples. The first two Italian-built 802s are now being fitted out. Train 4 in the overall programme (will be 802003) utilises body shells delivered complete from Japan while train 5 (802004) is the first to use body shells welded together at Pistoia. Modern laser-guided robot welding is used for the process. Hitachi expects series production to be 45 days per five-car train although the first trains will take longer; the five-car trains will all be built before the nine-car ones.